Minneapolis, MN, USA. February 20, 2018—East View Companies is pleased to announce the addition of Ms. Ariane Rückebeil as Account Manager located in Berlin, Germany. Ms. Rückebeil will be instrumental in expanding East View’s opportunities and customer service capabilities in Europe, and especially in Germany, Austria, and Switzerland. Ms. Rückebeil comes to East View with many years of experience in marketing, sales and account management in the publishing and information services industry, including positions at De Gruyter, Dawson Books, and most recently, as Key Account Manager for the subscription agent Schweitzer Academic. 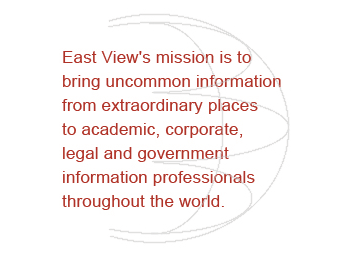 “East View prides itself on providing strategically relevant information from such culturally rich places as Eastern Europe, Eurasia, East Asia, the Middle East,” said Ms. Rückebeil, “I look forward to using my skills to help others benefit from our many book and periodical services and powerful online database products." Customers in Europe are welcome to contact Ms. Rückebeil at ariane.rueckebeil@eastview.com.